An odd thing I've noticed about Manhattan; no matter the day or time, the coffeehouses always seem packed to overflowing (well, at least the good ones). I've waited in lines with over 15 people ahead of me, something that I rarely do in a coffeehouse, but I guess since it's good java in a city of Starbucks misery, my subconscious never made it an issue. 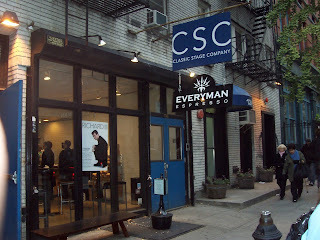 And so was the case with my first visit to Everyman Espresso, a once second location for Ninth Street Espresso which was sold apparently to a former employee. The place is right down the street (in the eastern direction) from a Joe the Art of Coffee location on E 13th S, and hence was very easy to find. When I arrived, I noticed a beautiful sign and a large store front of windows, though there seemed to be two doors (I later found out the facility is shared by the Classic Stage Company and hence, another door). Inside, the place was very open with small tall and short tables alike all clustered to the right and as mentioned before, a line almost out the door. They get their beans from Counter Culture but for one reason or another, they didn't have coffee available so I didn't get get to sample drip or press. But the espresso, oh what a delightful sweet chocolaty smoothness it held. Wonderful. Don't think they sell tea. 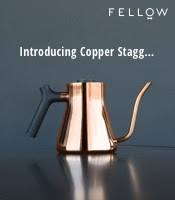 Overall, no disappointment here (even though I didn't get to try the drip or press, I've had Counter Culture before and it tends to sample very well). If you're in the area, definitely meander over to Everyman Espresso and as is the case with all Manhattan coffeehouses, don't let the line scare you. 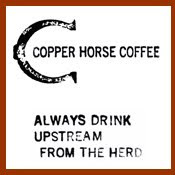 I was recommended to Everyman (back when it was 9th Street) - and have enjoyed some good coffee there - but nothing can excuse filthy bad manners and poor service. A good coffee is worth traveling for - but plenty of people can do just as well without the bad attitude and gouging price. Some of the staff are nice but docile and stupid - while others are just plain rude and uncaring. I'll be giving this cold, soul-less dump a big miss - because it's the common filth - not everyman - who need to wake up and smell the coffee. and I usually have the opposite experience there. always friendly.